PBS | Wait! What's A Dial? “His Last Vow” was a satisfying end to Sherlock‘s series 3. It contained everything a Sherlock fan could want: mystery, intrigue, reminders of the past, and the revelation of new secrets. Magnussen is basically Rupert Murdoch with a huge mansion and a malicious mind palace. Sherlock may like to call himself a sociopath, but Magnussen is one. Magnussen makes a living out of blackmailing people and publishing the results. 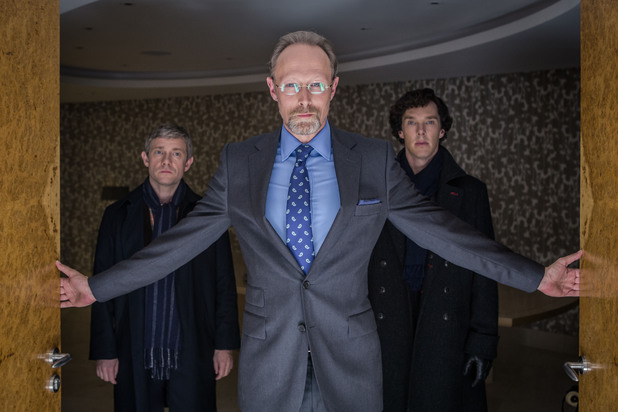 Not even Sherlock is immune from Magnussen’s power. Granted, Sherlock gets himself into trouble and always manages to make it out okay, but Magnussen did have Sherlock good. He manipulated Sherlock via his pressure point: John. Specifically, Magnussen threatens to disrupt John’s life as he currently knows it. He can reveal Mary Watson’s darkest secrets- secrets she hasn’t told John because she loves him and doesn’t want to scare him. “The Sign of Three” is not Sherlock‘s strongest episode, but it’s one of my favorites. 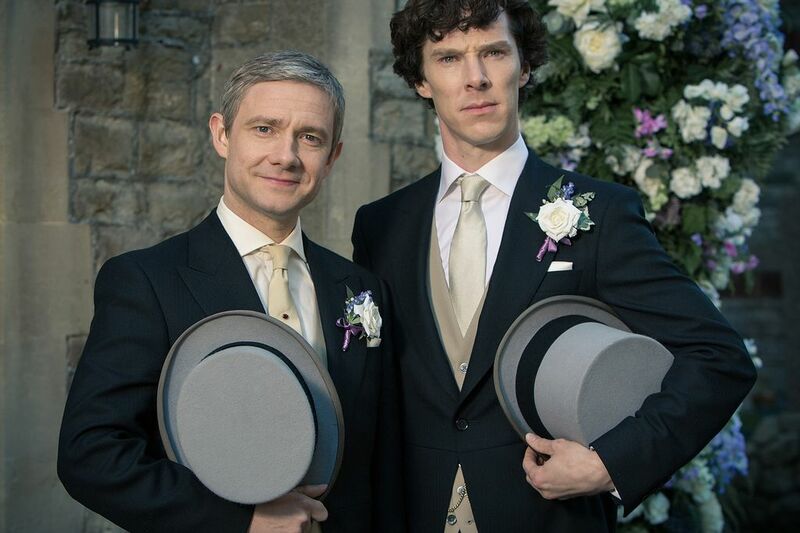 If it was not for Benedict Cumberbatch and Martin Freeman, I would not have sat through what amounted to little more than a 90 minute best man speech. 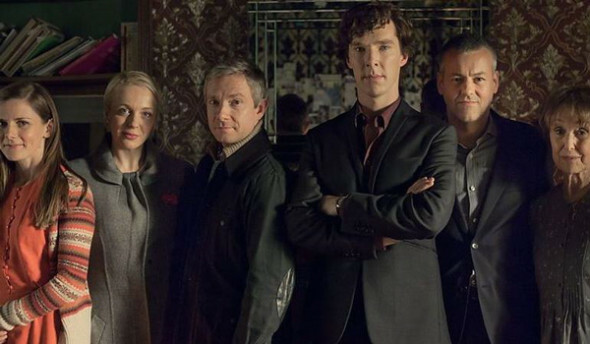 While the show will not go down as the best Sherlock episode, it was impressive that the writers pulled it off. It also showed that the lighter tone in the previous episode is here to stay, at least for another episode or two. Before John’s wedding to Mary Mortsan, Sherlock has to write his best man speech. It’s the hardest thing he’s ever had to do, so who does he call? Detective Lestrade, who just happens to be in the middle of solving the most important crime of his career. Having learned his lesson in the past, Lestrade drops everything and rushes to Baker Street with plenty of backup. He expects Sherlock to need help solving the crime. Nope. Sherlock called the police because he needs help writing funny stories about John. It’s a funny scene that show’s how much Lestrade relies on Sherlock, which is entirely too much. “The Empty Hearse” is the best Sherlock episode, so far. Unlike most Sherlock fans, I am not completely in love with the series. It has it low points and high points. There are two episodes I find completely unwatchable, yet the good episodes are markedly better than most modern television. Also, John Watson is my favorite character, not the eponymous one. That’s probably why I loved this episode: it focused mostly on John. After a two year hiatus, in both real and fictional time, Sherlock returns alive. We all knew he didn’t die. There was always going to be a series 3. No one’s watched “The Empty Hearse” thinking that Sherlock is dead. We tuned in because we wanted to know how John is doing, which was better than expected. He grieved and moved on. He misses Sherlock, but he is in love with Mary Morstan, who becomes his fiancée. While John wished Sherlock wasn’t dead, Sherlock came back at the worst possible time. John was getting ready to propose to Mary, but Sherlock thought it was the perfect time to act like a French waiter and refer to a wine as “a face from the past.” He doesn’t mean to be narcissistic, but Sherlock thinks everything’s about him. We know he has trouble with social cues. However, he should be aware of John’s habits, which typically don’t include dressing up in a suit and bringing a woman to a fancy restaurant. The master of deduction either can’t or chooses not to analyze his best friend. Every time John punched him, Sherlock deserved it. I found it hilarious because John’s reaction was completely natural. They love each other like brothers, yet Sherlock found it necessary to hide the truth from John for two years. John was perfectly justified in his reaction, which proves that some things never change. John and Sherlock fight like brothers, may threaten to never speak to each other again, yet they always find themselves solving crimes together. Steven Moffat and Mark Gatniss like to create elaborate universes for their fanbase. This includes having the BBC create websites that exist in the worlds of both Sherlock and the fans. The following list only has official blogs for Sherlock characters. There are no weird fetish Tumblrs or LiveJournal entries about what someone would like to do with Sherlock, John, and a tub of Cool Whip. 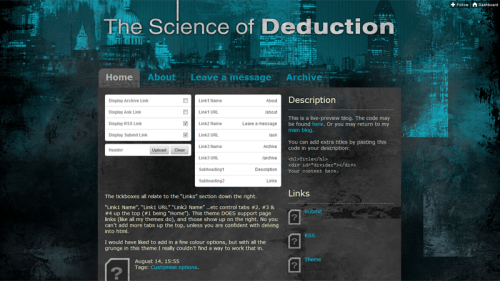 Sherlock’s website The Science of Deduction is identical to the one he updates in the show. It comes complete with a request for “interesting cases only please” and case files. Many of the case files direct those interested to John Watson’s blog because, according to Sherlock, people are more interested in what John has to say. Unfortunately, there is no phone number for female fans to call Benedict Cumberbatch asking for him to deduce some things. Sorry, Sherlock, but you’re right. John’s blog is more compelling. Prior to meeting Sherlock, John had nothing to write about, except for the occasional meeting with his mates. That all changed on January 29 (no year given). Since that fateful meeting, John has been blogging about his adventures with Sherlock. The posts correspond to specific Sherlock episodes, so John hasn’t update his blog in a while, but that should change when the first episode of series 3 airs on October 31 in the UK. Amazon Prime has been busy eating away at Netflix’s content library. The biggest problem for Netflix, so far, is it recently lost a ton of Viacom content. So what shows are Netflix customers now missing? Here is a lengthy, yet non-exhaustive list of Amazon Prime exclusive shows. Warning: Today’s video is more like Creepy TV Video of the Day. Despite 25 years passing, The Max Headroom incident is still very unsettling. In 1987, someone dressed as the 80s television character Max Headroom hijacked the signal of two Chicago television stations, WGN and WTTW. The first incident took place during the sports segment of WGN’s The Nine O’Clock News. WGN’s engineers were able to cut the hijacker’s broadcast short by switching the stations signal to a backup transmitter. A few hours later, the hijackers successfully took over WTTW’s signal for 90 seconds. The PBS affiliate’s engineers tried to stop the intrusion into the Doctor Who episode “Horror of Fang Rock,” but the hijacker’s broadcast was over by the time they started looking into it. The video below is from the second hijacking. NBC’s Utah affliate KSL refuses to carry The New Normal. Last Thursday, Jerry Nelson died at 78 years old. He was the voice of the Count on Sesame Street. Dancing With the Stars viewers have chosen Sabrina Bryan to be the 13th contestant on that show’s all-star season. Anthony Bourdain, host of the Travel Channel’s No Reservations, will take his show to CNN after its upcoming season is over. The former voice of Dora the Explorer, Caitlin Sanchez, attempts to sue Nickelodeon again because she says her lawyer committed fraud. In the original lawsuit, Sanchez claims she was fired for hitting puberty. Earlier today, The Academy of Television Arts & Sciences announced the 2012 Emmy Awards nominees. HBO (81 nominations) and CBS (60 nominations) lead the networks in nominations. Mad Men and American Horror Story (tied with 17 nominations) were shows nominated for the most awards.